Offset is not one to toy with. In a valiant effort to hold the fort, the Migos member sent out a warning shot Instagram. Although the nature of his post remains a mystery, one would be wise to put two and two together. Cardi B’s botched shoe fight with Nicki Minaj has cast the BX rapper under the wrong light, given their attempts to downplay any sort of “rivalry” in the past. What makes the matter more precarious is that Cardi B is now responsible for a 2-month old infant. She is therefore in a far less defensible position, and Offset a proud individual himself, in a far more protective role, given the circumstances. With that being said, Offset may be fending off another threat near the circumference. Or is he setting the tone “for the classroom” like a substitute teacher up to his neck in buffoonery? Either the way the message is clear, “Every N**** around you gone feel this smoke innocent and all lol,” he added to his IG storyboard. 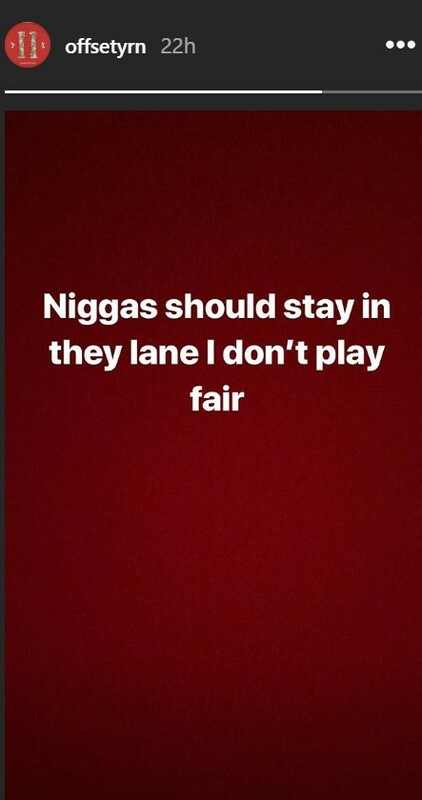 Offset subsequently posted another IG story in which he warned the general pop to stay in their lane because he “don’t play fair.” Let us see who catches his bait; stay tuned. « T.I. & Meek Mill Live Lavish South Of The Border In "Jefe"